Since we heard the rumors about a new Tesla Semi Truck coming, we have taunted our coach manufacturing friends with the concept of building a new coach. They were friendly with a Sure-Sure disbelief. Those of you that knows us well, know that we are deadly serious about our eccentric ideas. You also know that most of them come true. Tesla’s design aesthetic, which has been led by Franz von Holzhausen, has helped it amass a committed fan base as well as some equally passionate detractors. Regardless of whether a person loves or loathes them, a Tesla is unmistakable. 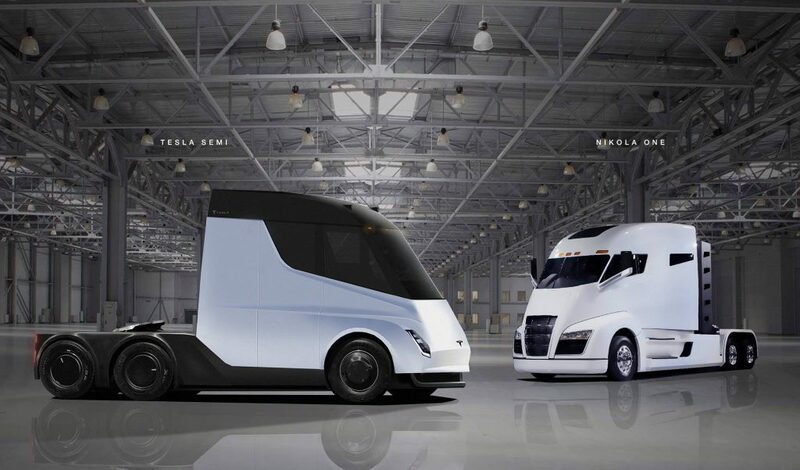 The Tesla Semi, the all-electric heavy-duty truck CEO Elon Musk unveiled Nov. 16, is no different. And not just because it shares a number of parts with its new mass-market passenger vehicle the Model 3, including the same motor, handles, and display screen. Fortune had a chance to get inside the Tesla Semi before the reveal. Here are the details that stood out. Approaching the cab, you immediately notice the angled windshield wipers—which look a lot like the one on the new Roadster prototype unveiled at the same event—and the shiny chrome door handles that are also on the new Model 3 passenger vehicle. There are no exterior steps like you might find on a traditional truck. Instead, the door is long and low. Once the door is opened a set black steps are inside. Walking up the short, steep steps, a long handle ready for support if needed, you arrive at the landing. This area is essentially divided into two areas. The big takeaway here is there is quite a bit of space, and the ceiling height is high enough to allow a person to stand upright. Towards the front of the cab is a central captain’s chair that is flanked by two display screens, one on each side. The screens are the same as the one inside the Model 3. The captain’s chair has air suspension, giving it a bouncy feel. Sitting the chair you immediately become aware of how forward you’re sitting. Designers were able to push the seating area forward in this cab because there is no engine, transmission, and other traditional diesel truck bits to get in the way. The result is similar to what it feels like to drive a VW bus. In the cockpit area, there are a number of cup holders. Many, many cup holders. There are also several areas to stow items, including in the door. The photo below isn’t the best representation of the actual size of the interior, which in person seems bigger. Behind the captain’s chair, and to the right, is a secondary seat that is stiffer and without the bounciness of the main one. In the back there are two overhead compartments that are similar to what you might find in an airplane. Keep in mind, that the Tesla Semi revealed last week is a testing prototype. Which means it will likely go through a series of small changes as the company prepares to produce it. 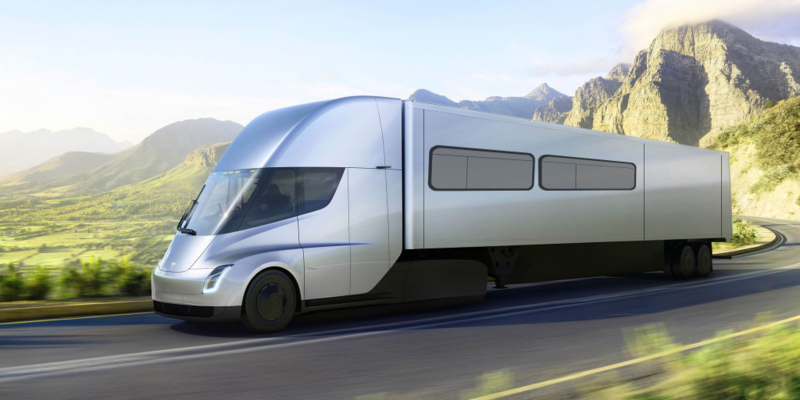 It’s also possible that production of the Tesla Semi will be delayed, or fail altogether. The company is already facing enormous challenges as it tries to work through production issues with its mass-marketing passenger vehicle, the Model 3, and the growing list of other projects the company is pursuing. We started to think Tesla when the model X was announced. We hoped to tow it behind our Grizzly recharging as we drove. Alas, the Tesla engineers said No No! Then we heard about the semi and the idea of an autonomous electric driving machine reignited our interest. Clearly we can see and justify the expense of a new coach, not for the promise of low cost per mile or even the million mile guarantee. What excites us is the idea of an autonomous machine that we can point, give it a location and kick back while it does the work. If necessary, round the clock driving will be possible as we have figured out how to charge the batteries while driving rain or shine. The concept, look, feel and appeal are very exciting to us. This image is a grab from the Tesla site with some photoshoping to simulate the coach. We are riding to design concepts. One is a traditional motorcoach where we stretch the Tesla chassis and build a modern box on the back. The second is more radical! Looking at the second design, we envision a permanent 5th wheel with two very interesting features. One would be a movable 5th wheel that would pull the trailer part in at highway speed tucking it behind the tractor. The second feature turns the 5th wheel from a trailer to a coach by using an accordion mechanism that connects the front of the trailer with a passthrough allowing access from the tractor to the coach portion of the vehicle. The accordion would be one from the articulated busses and there would be an opening at the rear of the cab connecting the two. The accordion would be almost invisible when at highway speed and would retract with the movable 5th wheel for turning and backing up. This is not a totally new concept as it was debuted on the Wal-Mart truck of the future. The plan for either will be a space age interior snagging featured from the Boeing Dreamliner. The other thing would be that the coach would be 13’6″ which is the legal maximum . There would be only solar on the roof with air-conditioners and normal roof stuff modernized. The 53′ trailer coach would be easier to drive, turn and park because of the shorter wheelbase. 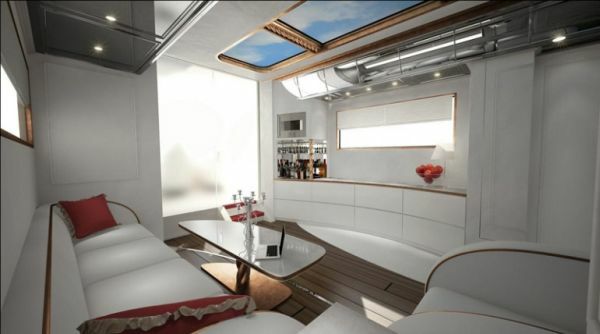 The interior size would be in the 700′ sq range with four slides out. The garage would be a lowering ramp that would extend outward to deliver the car. Storing would be a drive on ramp that would pull into the bottom of the low slung rear compartment. A remote would pull the car in and lift the rear up and closed for travel. The master bedroom would be on top of the garage and even possibly lower when the garage is empty. So, we will continued to update you as we move forward. May seem farfetched, but you have to start with a dream. Right!